It was a dark and stormy night, wait … that’s a lie. It was like any other winter night in Los Angeles – bicyclists taking to the streets in large groups, indie bands playing behind thrift stores, a mass brawl and stabbing at a USC vs. UCLA football game. 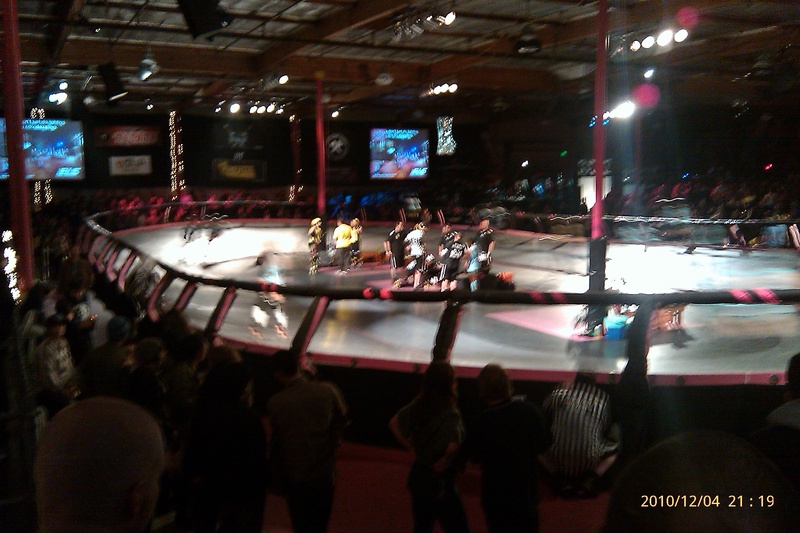 Nothing out of the ordinary except the 2010 LOS ANGELES DERBY DOLL CHAMPIONSHIP!!! 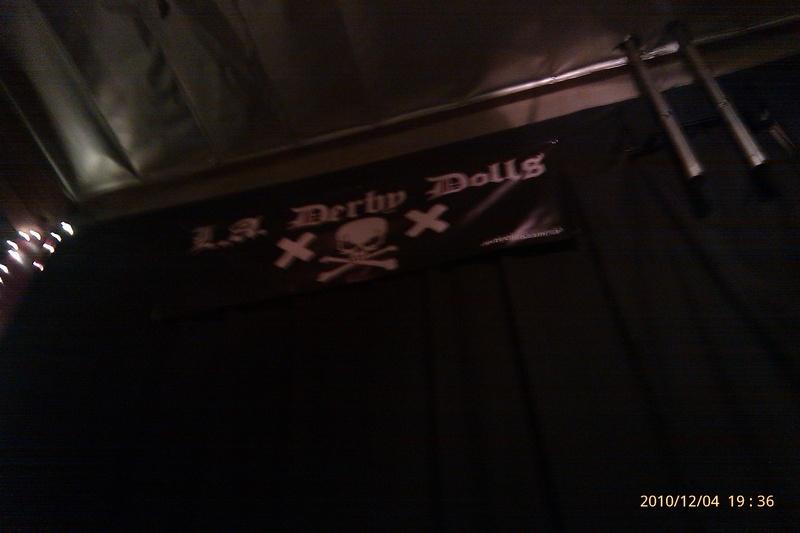 If you see this famous skull and crossbones then you know you are in L.A. Derby Doll territory. Yes, that’s right Saturday, December 4, saw the showdown that brought the Southern California Derby Dolls together under one roof as the Los Angeles Tough Cookies took on the San Diego Swarm for bragging rights as to who gets the title of the best girls on skates. As roller derby goes the all-female (hence the name) Los Angeles Derby Dolls skate on a banked track. This makes the action more exciting as the speed, the falls and the wins seem ever so much sweeter. 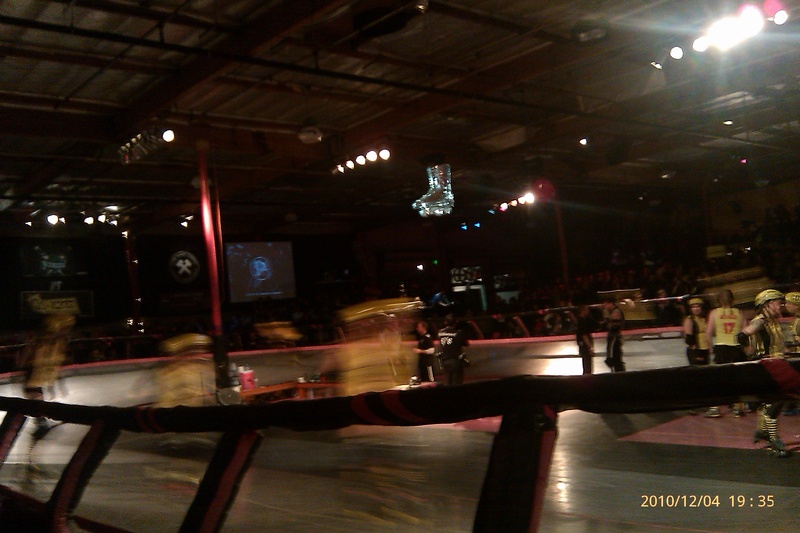 It also makes the Derby Dolls one of the few leagues in the Unites States that skate on such a track. Wikipedia even claims that in the United States there are only five other such leagues. The L.A. Tough Cookies skate around the banked track to warm up for the second half. I want to make a disclaimer here for while there are other “Derby Doll” leagues in this wonderful and wide world, I have maybe preemptively named the Los Angeles Derby Dolls (LADD) part of the Southern California Derby Dolls (a nonexistent league) that would be composed of the San Diego Derby Dolls (SDDD) with the LADD, and the soon to be Orange County Derby Dolls (OCDD). Notice the last acronym is close to OCD, which this whole paragraph might be considered. To end the suspense, the Tough Cookies put down the Swarm with a stunning 148 to 106 victory. Now this was my first roller derby, but I follow basketball and when you win by 40 points, especially in a championship game that means you dominated the other team. The Tough Cookies obviously had the home-track advantage as last years champions. They also won in 2008. So when they got a lucky break in the first half with a heavily penalized San Diego team loosing players to the gruesome death-squad referees (is that their name? ); it was somewhat of a surprise when the Cookies only led by 4 at the half. Without the Swarm picking up those penalties it could have been the Cookies down by 40. The champions however showed the rough and tumble team that you would expect to win-it-all as they used some well placed penalties and Krissy Krash’s dominating defense to thin out the Swarms ranks in the second half. The San Diego Swarm taking a quick team meeting before the 2010 championship game. Possibly the best thing about the LADD jam other than the beautiful people in derby attire everywhere is the plethora of sites that make up a normal night for the dolls. At halftime a metal/punk band with some actual talent played for the fans, even though I never caught their name so who cares anyway (sorry good band that played!!!!). Hot Dog On A Stick sold its famous breaded delights, my personal favorites, along with other food trucks that posted in the parking lot. (IS IT TRUE THAT THE FOOD TRUCKS GOT THE TABLES REMOVED FROM THE SIDEWALK IN FRONT OF ABOTT’S PIZZA CO!!! I WILL KILL!!!). Roller derby girls check out the band. The amount of t-shirts, knickknacks, and memorabilia along with pure energy of the game fulfilled my need for commercial exploitation that I get at all sports events. They also sold beer for those inclined to down a cold one. 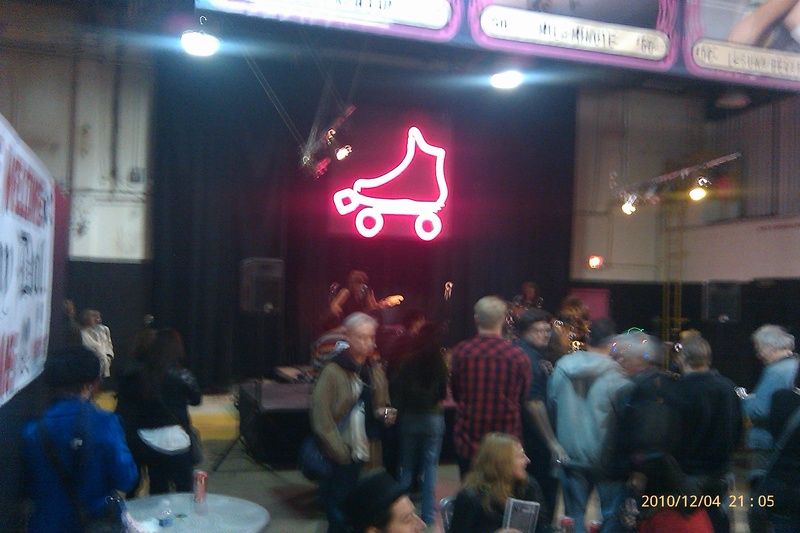 All-in-all I give the whole night 5-stars and if you have a roller derby in your town (New York??) I say go support the beautiful women as the punch it out. Oh yeah as the Los Angeles Times reported in 2008 that Alex Cohen from NPR was a roller girls, too bad you can’t read the first few paragraphs on my Firefox browser because some stupid Google ad!!! You can check the article for a breakdown of the rules in simple form, too. Also, if you are in Chicago on December 11 check out the L.A. Derby Dolls as they compete against the Windy City Rollers in the Red Bull Banked Jam. GO L.A.!!! Stab someone in the parking lot to show how we do in the City of Sin (no don’t I was joking). Also, last interesting fact – an L.A. Derby Doll wrote the script for the movie “Whip It!” and the dolls skated in that movie. I love you Derby Dolls!!! 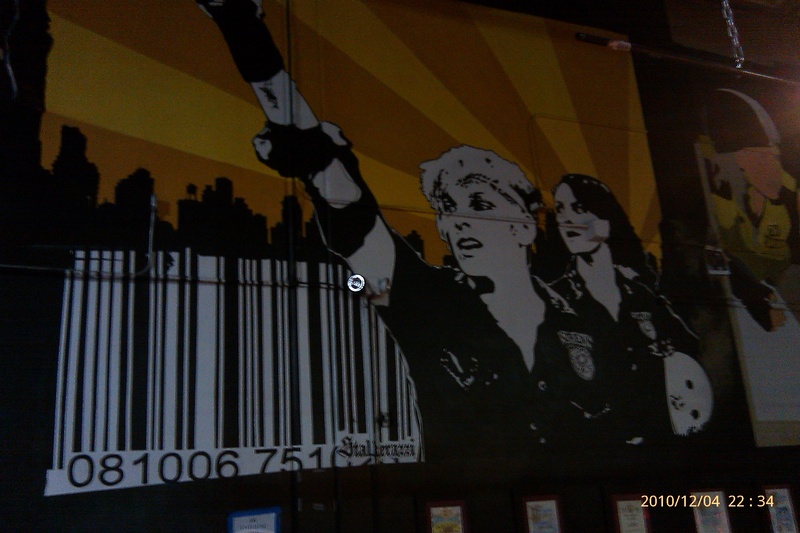 This entry was posted in culture, Downtown LA, Echo Park, L.A., L.A. Derby Dolls, LA, Los Angeles, LosAngeles, Silver Lake and tagged culture, fun, LA, LA Derby Dolls, Los Angeles, roller derby. Bookmark the permalink.